Some of my customs on display- BLOOD FOR THE BARON!!!
. . . don't get too excited, but as I now work at Snibston Discovery Museum (based in Coalville and part of Leicestershire County Council, which holds a collection relating to Palitoy), I have been invited to put together a small display of my customs to be shown in their modest Toy Box gallery. This will be a very small display (the case is about 70cm square). It will be installed in early November and run until after Christmas I think (no specific time scale). As there is currently no Action Force in the Toy Box, I couldn't miss the opportunity and am chuffed to be asked. 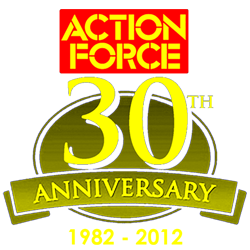 There will also probably be a copy of Battle Action Force, one of the mini comics and a vehicle blue print. From the County Council's collection will be a carded figure. I hope they will also keep my reference to BFTB in the brief background text. I will take pictures when it is in place. Adult entry to the museum is £7.50 and it's a great place for those with children (children are £5 entry and family tickets are available). There are interactive exhibits in the the early galleries (life a Mini, make fire and general science / technology play) and some larger exhibits (steam locos, buses, fire engine, Auster aircraft etc) and other displays elsewhere. At weekends you can take a 45 - 60 minute colliery tour with a former miner (at a small extra charge). Beyond all this, for anyone visiting just for toys, I do warn you that the Toy Box is a very modest space containing a very eclectic mix of Palitoy's production (as mentioned, no Action Force generally! ); and my display will be very very small and certainly not worth £7.50 on it's own. Ah wow! That is fantastic news, well done! Can't wait to see the pics and I envy any visitor who sees your display. Our plan to infiltrate the Coalville politico-military-industrial complex is complete. Hail Eisenblut! Thats great! Would love to come along and see them in person. Looking forward to seeing the photo's of the finished display. That's bloody brilliant, mate! Well done! I'll be along to view it too, would be nice to meet up. Exciting stuff! Well done fella. Well done RB that's great news. Thanks guys. Sadly, I've not had much time to do many new customs recently. I'm in the process of sorting out the room where I work on customs (which houses my James Bond collection in the main). So I have no work space for the time being. I'm also having a major desire to reduce my collections to more sensible levels, at which I can properly enjoy them. I'd like to get more of my Action Force collection out, but these days I even have too many customs - I don't think I could ever bring myself to sell them though.